A heavy duty rack suitable for light commercial environments. 56" wide to hold a full 5-50lb set of hex dumbbells. The open channel in the shelves is 4.5" wide. Most dumbbells have handles over 4.5" long and will fit with room to spare. 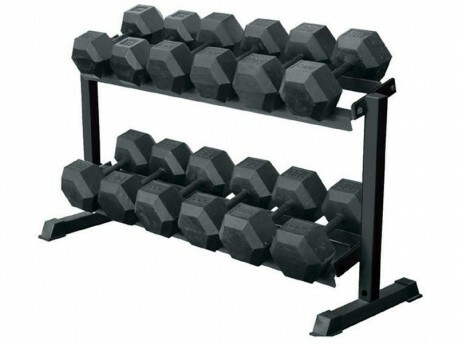 The York Legacy dumbbells 30lb and up will fit.